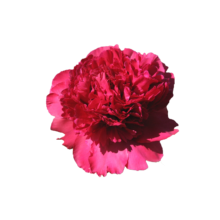 Best man is a spicy pink peony that tends towards cerise. Thanks to the color, he immediately jumps out. The flower opens up in a nice bulb shape and is extremely filled. Best man is a late bloomer and his showy flowers appear in late spring or early summer. Like many varieties such as Diana Parks, Best man was bred by the famous breeder Roy Klehm. This peony excels as a cut flower.